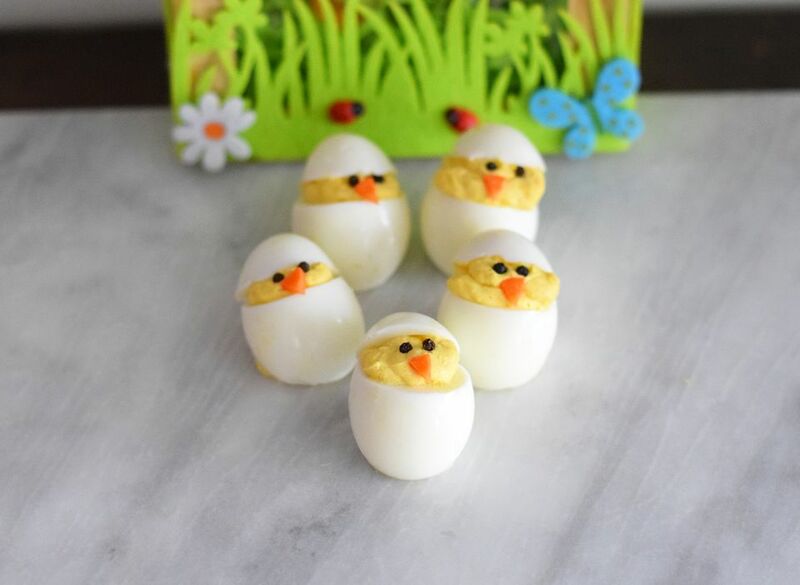 These adorable Easter deviled eggs are sure to please both kids and grown-ups alike this holiday! These adorable chick-shaped eggs are full of flavor and much easier to make than they look. All you need to put these deviled eggs together are a knife and a pastry bag (you can even use a Ziploc bag). You also don't need a special deviled egg plate for serving. Since the very bottoms are cut off, they sit nicely on any plate. Little peppercorns and carrot wedges make the adorable eyes and beaks. They look like little hatching chicks and are a little too easy to pop into your mouth! If you are feeling up to the challenge, cut more of the carrot into little tiny feet for the deviled egg chicks. If you like your food spicy, we recommend adding a little cayenne pepper (about 1/8 teaspoon) to the egg yolk mixture for a nice kick. You can also use any of your favorite deviled egg mix-ins, like jalapeño, lemon, parsley, bacon, or your favorite hot sauce. Place the eggs into a medium or large pot of cold water. Place onto the stove and cover with a lid, heat on medium-high heat, until boiling. Once the water is boiling, turn off the heat and leave the pot covered for 12 minutes. Once the 12 minutes have passed, drain the hard-boiled eggs and run them under cold water for 1 minute. Wait for the eggs to cool slightly and then peel them. Once the eggs have completely cooled, cut off the top 1/2-inch of each egg. Gently, scoop out the yolks and place them in a medium-sized bowl. Add the mayonnaise, yellow mustard, pickle relish, paprika, and salt and pepper to the egg yolks. Whisk together until completely smooth. Place the egg yolk mixture into a pastry bag with a medium-sized round opening. Cut the bottom off of the larger part of the egg white so that it will stand upright on a plate. Pipe the egg yolk mixture into the bottom of each egg white so that it stands about 1/2-inch over the top of the egg white. Cut each carrot round into tiny, pizza-like wedges. Place one carrot wedge on each deviled egg so that it resembles a beak. Carefully place two peppercorns on each deviled eggs as the eyes. It may help to use a tweezer to place the beak, eyes, and feet onto the deviled eggs. Serve immediately or cover and refrigerate for up to one day until you are ready to serve.